Greetings from India where David and I just participated in India's January National Immunization Day (NID). Our two coupled Rotary Zones 33 and 34 were represented by about 40 Rotarians and partners. 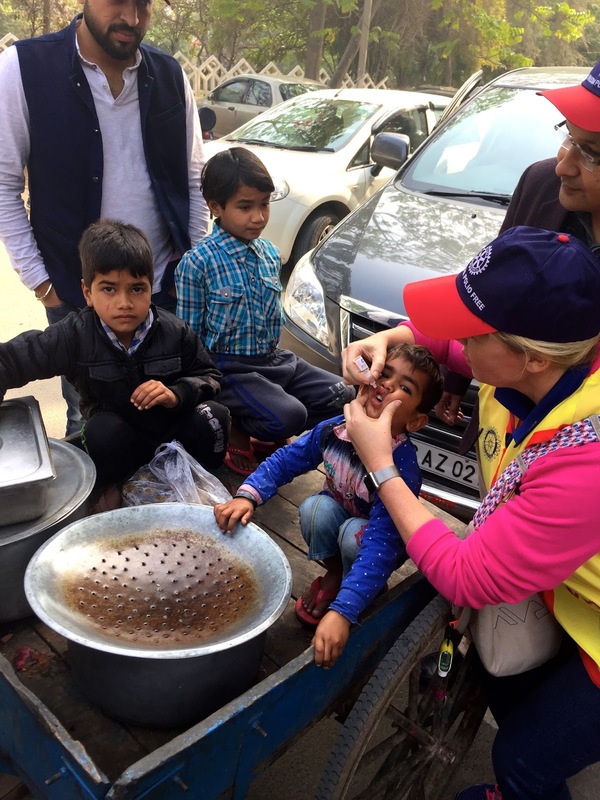 Having been polio free for just over six years, India remains diligent in the execution and planning of these NIDs and in making sure those who cross its borders from endemic countries are immunized. We wore vests, hats and pins that exclaimed , "Keep India Polio Free" and "A Dream Come True." We were honored to have the opportunity to administer those precious drops of polio vaccine to children in polio camps (booths in villages supervised by a public health worker) and then on what they referred to as "mop up day" (Monday following the official NID) walking in poor areas, going door to door administering drops to children without a purple pinky. Children who receive the drops have the left small pinky painted purple. David has chronicled a blog post of the trip, visit the blog site for more on the trip: RotaryZones33-34PolioWarriors. These children, presumably brothers, arrived in the back of a rickshaw for their immunizations. When David said at one point, "It is a trip like this that makes you a Rotarian." I understood. If you get the opportunity to take part in an NID, I hope you'll consider it. 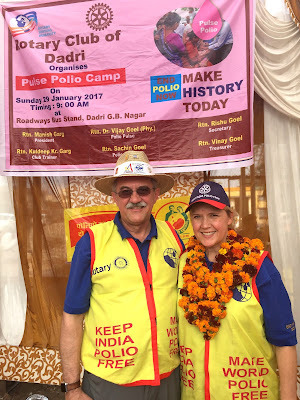 The trip's crescendo may have been in hearing news from home that our Arch Klumph Society gift, received recently on World Polio Day, was designated as a PolioPlus gift, meaning the $250,000 gift becomes $750,000 with the Gates match. With polio remaining endemic in only three countries and continued support from Rotarians like those in our own District 6910, I'm confident we shall see an end to this disease for which there is no cure, in the near future. Area Rotary clubs sponsored each booth or 'camp' where a public health worker oversees the administration of drops. We were greeted with these garlands when arriving at this one. We recently lost Marla Panyik, a beloved Rotarian who always wore a beautiful smile. In honor of Marla, a retired educator and wife of Past District Governor Rich Panyik, The Rotary Club of Loganville is establishing a scholarship in Marla Panyik's name at Gwinnett Tech.The club is a 501(c)3 organization. Checks can be made to the Rotary Club of Loganville, designated for Marla Panyik Scholarship Fund, and mailed to P.O Box 2267, Loganville GA 30052. The club has started the fund with over $6,000 in the fund from club members. We are expecting record numbers of Rotarians from around the world in June when we celebrate 100 years of The Rotary Foundation. If you haven't registered yet, there's still time. Register here to attend. You'll get an opportunity to take part in the largest birthday party ever and volunteer with your club or individually. There will be informative breakout sessions and inspiring general sessions led by world class speakers. We are well on our way to achieving 100% Paul Harris Fellow Clubs. I just received update from Past District Governor/District Foundation Chair that we now have have 40 clubs certified 100% Paul Harris Fellow Club with several others very close. Look for the complete list in my next monthly message. Thank you for all you have done in achieving this goal. Our District 6910 has shown banner membership growth this year, the top growing district in our Zone 34. I want to thank Pepper Pettit and Scott Yochum for their outstanding leadership as District Membership Chairs. 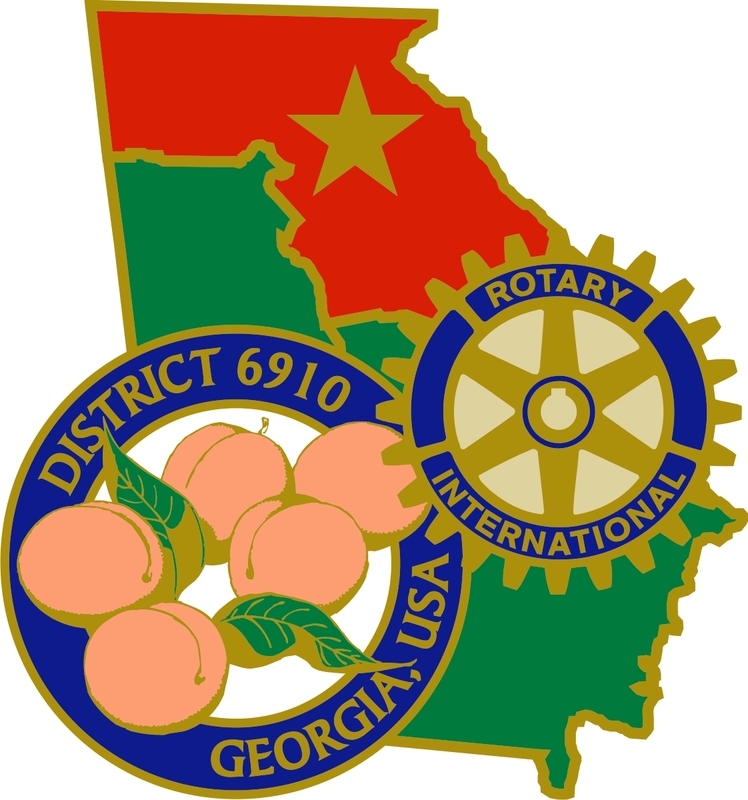 Oconee County leads the district in membership growth as of now with 29% growth since the beginning of this Rotary year. Congratulations, Rotary Club of Oconee County! Have you sponsored a new Rotarian yet this year? The invitation to Rotary is a gift, and I hope you'll extend at least one this Rotary year. Finally, I have never known of a time when we were in such need of peace. Our district will be recognized as a Peace Building District beginning this year. My identified successors have agreed to continue this designation. A Peace Building District helps fund a Peace Fellow annually. Your club can be a Peace Building Club by promoting Peace-Building and understand In your community. For more information, visit and join the Rotarian Action Group for Peace. Great work! Thank you for your leadership and sevice to others. Can't wait to hear more about your trip !